Distinguished Scientist: Wayne Stuberg, P.T., Ph.D.
Name: Wayne Stuberg, P.T., Ph.D. 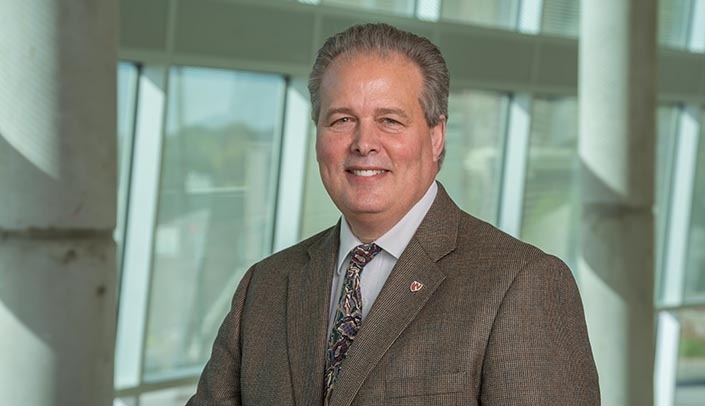 The Distinguished Scientist Award -- which is sponsored by the chancellor -- recognizes researchers who have been among the most productive scientists at UNMC during the past five years. The goal of my research is: To provide children and adults with intellectual and developmental disabilities the opportunity to reach their highest level of independence that is possible and that they desire. My research will make a difference because: It will help society focus on the framework of caring for all citizens in a fair and equitable manner. The best advice I've ever been given is: Do unto others as you would have them do unto you. One of my hobbies is restoration work in our historic Omaha home. I played football for the Cornhuskers in the '70s. Congratulations! What a wonderful honor. Congrats Wayne! Thanks for making a difference in the lives of so many. Congratulations and thank you for your commitment to those with ID. Wayne, You are a model faculty member. Your contributions to UNMC are so obvious. Kudos to a stellar scientist, health care professional, and teacher. And an all-around great guy. Congratulations Wayne on this well-deserved honor! Congratulations, Wayne, on this honor and all your great work. Kudos, Wayne! Great to see you get the recognition you deserve! Congratulations, Wayne. I am so pleased with your accomplishments over the years, my friend. Congratulations Wayne! Thanks for all you do! A campus ceremony will be held at 4 p.m. on Feb. 13 in the Durham Research Center Auditorium to recognize the scientist laureate, distinguished scientists and new investigators, as well as the winners of the Community Service to Research Award. A reception will follow.